OTONEWS - Formula 1 racing event now has a new safety car. Mercedes-Benz AMG GT S will replace her sister, Mercedes SLS AMG to be a safety car at the F1 race this year. Mercy claims, AMG GT S will present no less loud noise with cars coming down to compete in F1. "It's like music to the ears of fans of Formula 1 in the stands and in front of their TV screens. GT S is equipped with a modified exhaust system so that the performance of the AMG V8 engine sound more striking and emotive," said Mercedes. AMG GT S who served as F1 safety car was carrying twin turbo V8 engine of 4.0 liter. The machine is capable of spraying power up to 510 bhp with maximum torque of 479 lb-ft. Power is channeled through a dual-clutch gearbox to a seven-speed rear-wheel drive. Acceleration from a standstill to 100 km / h takes only 3.8 seconds. Can reach a top speed of 321 km / h.
As the safety car, the car is getting a big siren orange lights on the roof to signal authority attached to the carbon fiber air scoop. The orange light mean should not overtake, and when the light turned green, F1 racer is allowed to start racing. On the inside, there is a TV camera. While the views of the outside present a special number plates, as well as the headlights and rear lights with strobe effect. In addition to the safety car, Mercy also provide F1 Medical Car by relying on the latest C63 AMG Estate. The engine is the same as the engine AMG GT S. But the performance is slightly below the AMG GT S with acceleration from 0-100 km / h in just 4.1 seconds and recorded a top speed of 249 km / h.
The car got all kinds of medical equipment. In addition, there were also adaptive suspension AMG, some fancy lights and hotspot in the car. 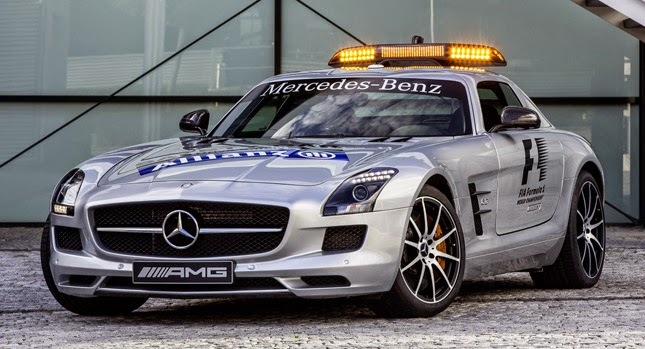 No Comment "Mercy AMG GT S Become Safety Car F1"